We took Route 50 through the entire state, and overall, it was a good ride. 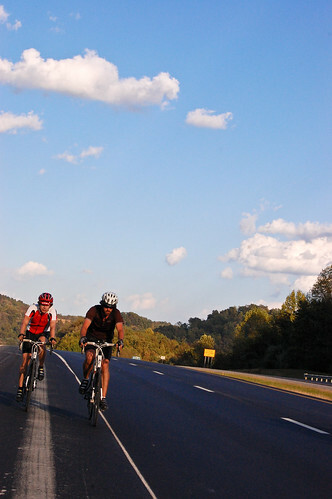 If you are comfortable dealing with three super-large inclines, Route 50 is a gorgeous stretch of road with room to ride, and will take you through a part of West Virginia few people experience. The state is filled with music, and all of us at Bandcycle are disappointed we weren't able to take more time to check it out. Multiple people directed us toward The Purple Fiddle, so if you are in middle of West Virginia, we recommend you stop by. They have live music every night. It sounds great. In Parkersburg we stayed with our new couchsurfing friend, Meg, who cooked a delicious meal filled with all sorts of delights (notably, roasted Brussels sprouts, which were unexpectedly delicious). The city looked like it had seen better days; the downtown seemed unchanged since the 70s. Hopefully the region will find a new, wealth-bringing industry in the coming years, because the people and landscape truly live up to the state's slogan - Wild and Wonderful. Tomorrow we head to Athens, Ohio. We're excited to enter the Midwest, but we're more excited to hear music from The New Vinton County Frogwhompers, an Athens-based band that played a large role in bringing bluegrass music to mainstream audiences in the late 70s and early 80s. A true Appalachian band, we look forward to what will surely be a memorable evening.